Suitable for 28mm and 45mm straight blades. Get rid off dull spots and burrs by simply rolling the sharpener on the table. 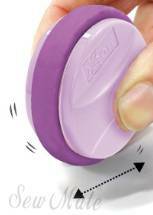 -Includes magnetic holder for removing blades safely. BUY 3 OR MORE AT $8.95 each .